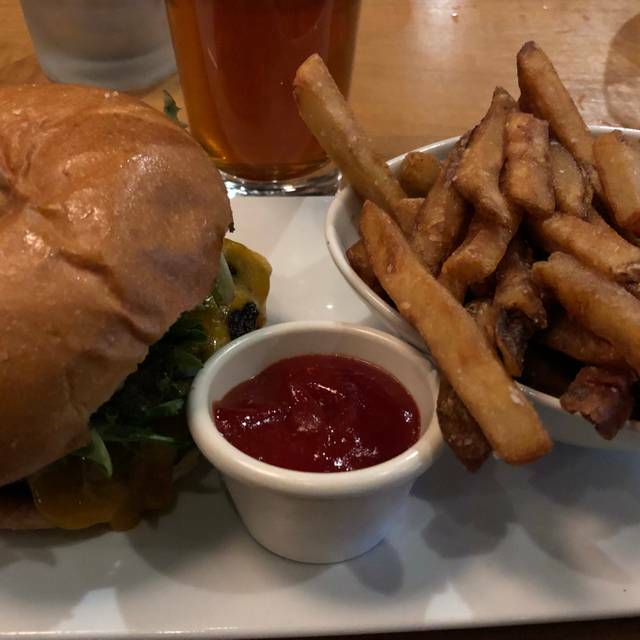 Harpers Landing is an upbeat, casual North American bar & grill, serving market-fresh cuisine, made from scratch & borrowing from the myriad of global cuisines. We offer a satisfying & wide-ranging menu augmented by a deep wine list, 36 by the glass, 16 beers on tap & an extensive selection on liquors. 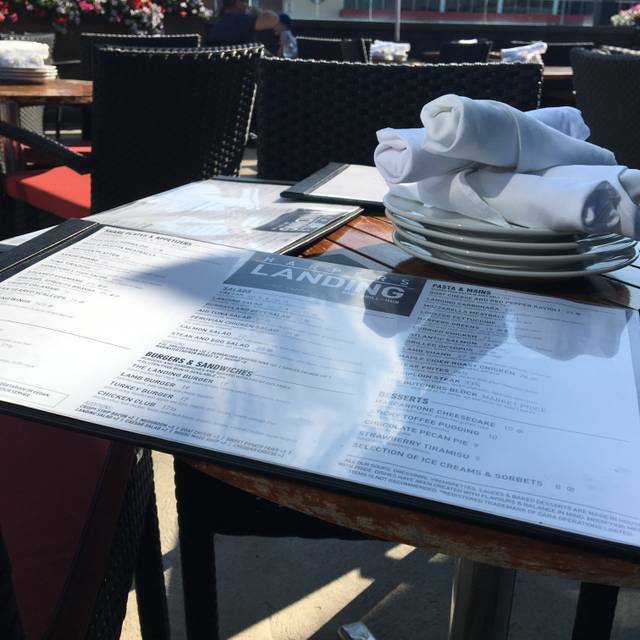 Eight large video monitors broadcast sports, mood-enhancing DJs on weekends & a spectacular heated seasonal patio create an ambiance like no other in the Oakville area. Private room accommodates 30 seated. Partitions are drawn to separate this space from the main DR.
Cornwall Rd; 10 minutewalk to Oakville "Go"
Have been here many times and always had great food and service. A few more vegetarian or vegan options would be nice though! It may be possible to lower the music a bit. We were in a booth so it wasn’t as bad as expected but the music is quite loud for conversation. We had a good night, the food was excellent. There was a small mixup with our appetizer but was corrected quickly. Once our food arrived we didn’t see our server for a while and it took a bit to get her attention for a water refill, but not that big of a deal. We do go here often, sometimes with a reservation others just a spur of the moment and they never disappoint. $100 for two club sandwiches, one hamburger, two coffees, and one tea seemed expensive. First visit to Harpers Landing. Went for Dad's birthday dinner - all 3 of us ordered the steak and thought it was great. Will be back. It’s a nice place but it’s very loud. I visited this restaurant for the first time Friday night and I was shouting with my dinner date. The live dj was cool, but a little too loud. For $14 for their Harper's Landing Breakfast I was expecting more than 3 half-pieces of overdone bacon and 2 fridge-cold slices of home-made chorizo sausage to go with my 2 eggs and unbuttered toast. The home fries were nicely done, the fresh red and yellow pepper pieces (all 5 of 'em - 3 red, 2 yellow) were a nice touch, but the 4 sliced cherry tomatoes were entirely too small and unnecessary. One breakfast I will not be getting again, for sure, unless they up the amount of bacon and sausage, and warm the sausage. Great food and good service. I would visit again the next time I’m in Oakville. The food was good and service was good as well kids had a blast. It was birthday and had a Girls Night Out!!! Thankyou for the wonderful experience my daughter had on he 16th Birthday. She was very happy with the service. 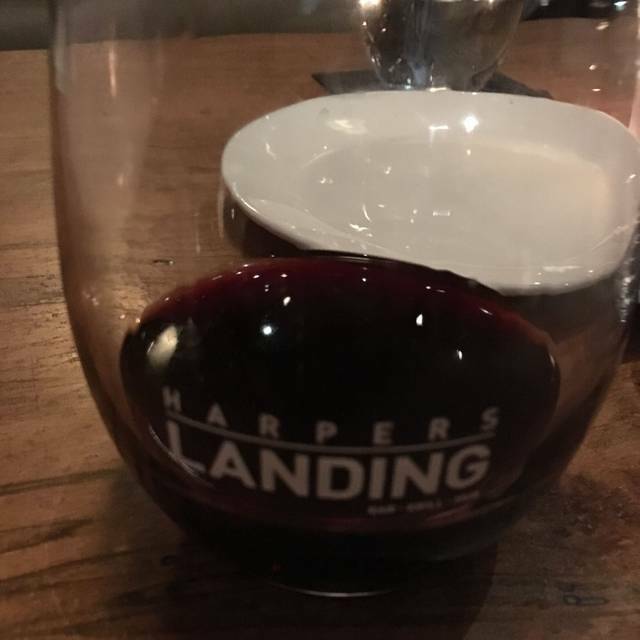 My wife and I had a very good meal at Harpers Landing. We split the buffula and beet salad which was great. We then had steak and frites, mine was done correctly but my wife’s was a bit under done. The portions were a good size. Our server was nice and attentive. I would come back again. Our server was very good but there were two very abrupt and obvious change to the abundance. First in the music at one point and the volume was also increased to a point (was way too loud) that we had to talk louder to hear each other and we were in a both of 4 people. Also noticed a server make a questionable face when this happened and other tables started to leave around this same time. I will consider this the next time I’m booking a get together over dinner. This location will be removed from the go to place. There was also a big change to the lighting at one point - seemed to go from dinner lighting to club lighting. This is not pleasant if the intent is to meeting up for dinner with friends to catch up on a week night. If we wanted overly load music and very dim lighting we would have gone to a club. Ordered fish tacos which I’ve had here before and they were delicious- so much so I raved to family and friends about them BUT this time they were just okay the piece of fish was barely noticeable in appearance and taste it appeared to almost be the same size as a fresh fry (the ones that come w/ the burger) or half an medium sized onion ring. Glad there were other flavours profiles going on in the tacos. What’s happening with this place? Kids steak wasn't very big and my daughter still felt a bit hungry after she had finished. All else was good. Friendly waiting staff a nice welcome and good wine. Went on a week night to have dinner with friends. We ordered the grilled octopus, the moroccan curry chicken and the special of the day, king fish. We were all very happy we our choices. I ordered the moroccan curry chicken and it was amazing!!! For desert we shared the sticky toffee and was amazing. We will certainly go back. the staff is organized and have excellent manners when addressing customers. The food is well plated and overall delicious. It was a great place to have a nice conversation over a meal. It was a little loud but the noise doesn't take away from the overall experience. Some dishes may take longer to be prepared however it is worth the wait. I would definitely recommend trying the Butcher's Block the next time you visit for it is cooked beautifully and is normally served with a wide array of scrumptious sauces and sides. In conclusion, Harper's Landings is an incredible restaurant and I would recommend visiting them sometime soon. Food was horrible. No clue why this place has great ratings. Seriously wondering if writing good reviews is part of their staff's job descriptions. Our waitress Chloe was exceptional - she made our Christmas lunch with friends even more enjoyable. Excellent and friendly waiter. Service was timely. No complaints whatsoever there. Food was excellent according to m group's reactions. The only thing I was a bit disappointed in was that the table for six was a bit tight....if you have no coat hangers then we have to squeeze around coats in winter. Not really thrilled about that. Service has really gone downhill here. We waited over 20 minutes for our server to take our main course orders, and by that time we had already finished our oyster appetizers (which also didn’t come with oyster forks). One order was incomplete and I had to point it out to the server. Food was good overall. My bill was $16 plus HST more than it should have been and again had to point it out to the server! Overall excellent. A bit too loud though. Overall the place was great. Food was good and a nice atmosphere. Our party found it a litttle loud for talking if that is what you wanted to and the drinks a bit pricey! Loved celebrating my boyfriends birthday here. The food was great, the servers were amazing and we had the best time! Thank you. Slow service and way too loud for a restaurant. Food was good. My wife and I had dinner at HL prior to attending a concert at the Oakville performing arts centre. The food and service were both outstanding. We attend HL on a regular basis and have always had a great meal. Fish Tacos are the bomb! Everything was excellent, service wonderful, food great but I found the restaurant very loud and we were in a booth too. The booth beside us had several very loud children screaming which made the experience a little annoying. Perhaps a section for families and a section for adults would be a perfect solution. A great ambiance in this restaurant/bar. The food was amazing! Our waitress was also very pleasant and helpful. Will definitely be going back. Went here for a dinner with co-workers. It was my first time but a frequent for my co-workers. Good food, atmosphere and location.